Downtown Champaign is home to many old buildings, built so long ago their construction history is nearly lost. 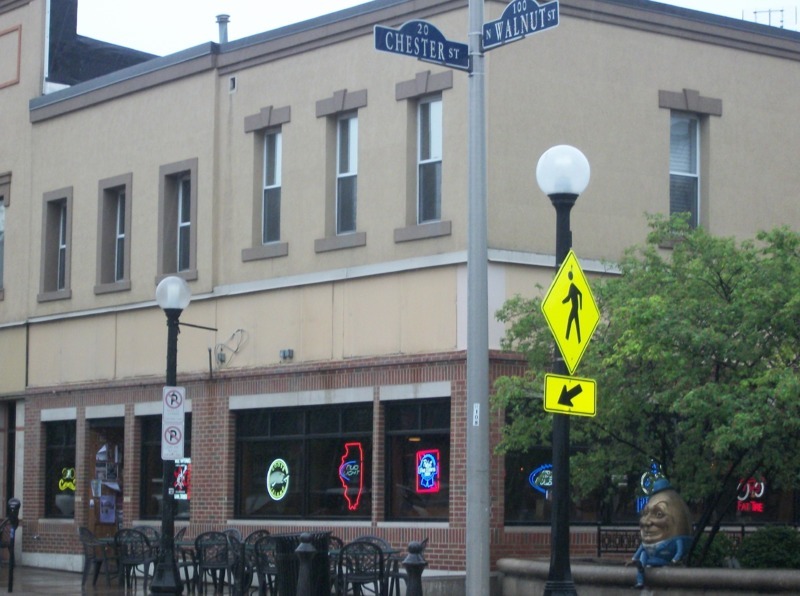 On the corner of Walnut and Chester, Esquire Lounge stands as one of the oldest bars in town. Old pictures and antique maps of Champaign line the walls. Bob Osiek, co-owner, said they got tired of putting up beer signs so they decided to decorate with ephemera from the town instead. The bar is busy, and drinks and conversation flow, which is exactly what the owners want. The building was a liquor store in the 1950’s, and became a bar when people stuck around after purchasing beer and started drinking and chatting with their friends at the end of the counter. Esquire Lounge, as it is known today, officially opened in 1977, and has slowly flourished into a fixture of downtown Champaign. Bob’s journey to opening Esquire was a winding one. He originally moved to the area in the 1970’s to attend the University of Illinois, and worked in bars during college. After graduation, he briefly left and worked on a salmon fishing boat, but decided this was not the career for him, so moved back and decided to do what he knew best–operate a bar. Esquire’s original focus was on the bar itself–according to Bob, “we didn’t know a lot about food. . .so we waded in carefully.” They eventually added food, and while the menu is not exhaustive, they have “quality ingredients and a quality selection.” Bob is also committed to providing a safe and comfortable place for people to socialize, and while Esquire may sell beers, burgers, liquor, and wine, what they really sell is the environment of friendship. KayLee Scott, “Esquire Lounge,” ExploreCU, accessed April 18, 2019, https://explorecu.org/items/show/397.